I'm having a real crabby week. And it might have started Saturday. A high school kind of moody, little things are getting me down kind of week. I had a meltdown at the gym. That was real cool. I am sick of my bum wrist... both bum wrists and I don't want to have to think about them anymore and I'm tired of getting setback in trying to get betterstrongerfaster. I'm going to be the worst old person, when all sorts of things start to ache and give me problems. Saturday I got mad when I tried to make this recipe. I burnt it. And I got mad at our stupid stove whose biggest burner isn't big enough for my cast iron pan so the rimmed edge hangs off and doesn't allow the pan to heat evenly. The edges of the rösti were only lightly browned, and the center was black, but I still ate most all of it. It's pretty great, so I remade it on Sunday for some friends I had over. I don't think they thought I was too weird for taking pictures, and they gave it their thumbs up. 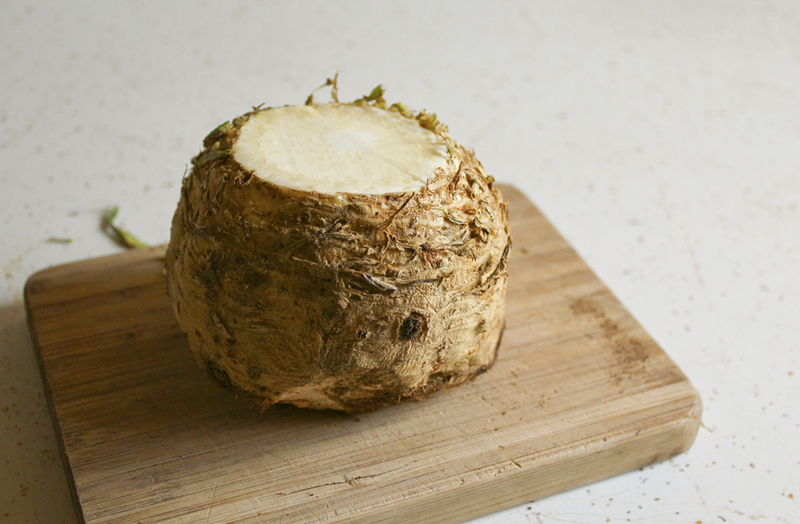 Celery root is a real miracle worker. Roasted, mashed, hashed, rösti-ed, whatever. It's like a celery scented potato. 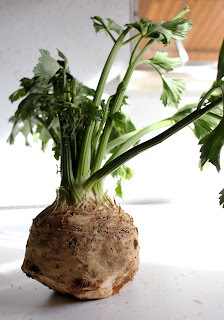 I think I shall plant some celery next year in my garden - which I plan on expanding. 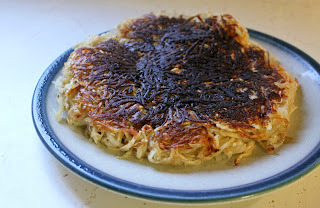 So, is it okay that I have two potato cake type things posted so closely to each other? 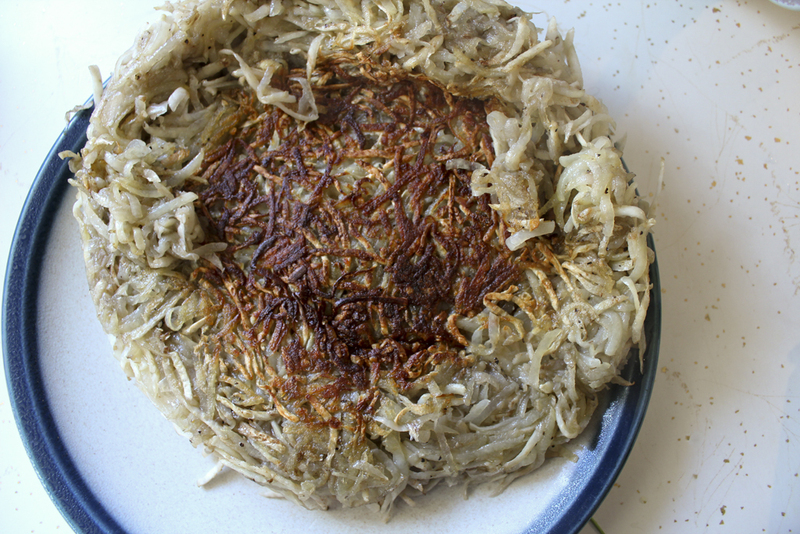 Is it ever not exciting to have a potato cake? I'm just thankful that this could be called some fancy foreign language name, and I am so fond of those you know, so that I didn't look so redundant. I'd hasten to say that you could use many a root vegetable for this little shredded cake. Rutabaga and celeriac? Potato, turnip, and sweet potato? 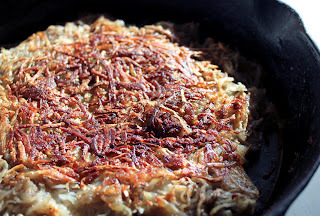 Oh, and caramelized onions? 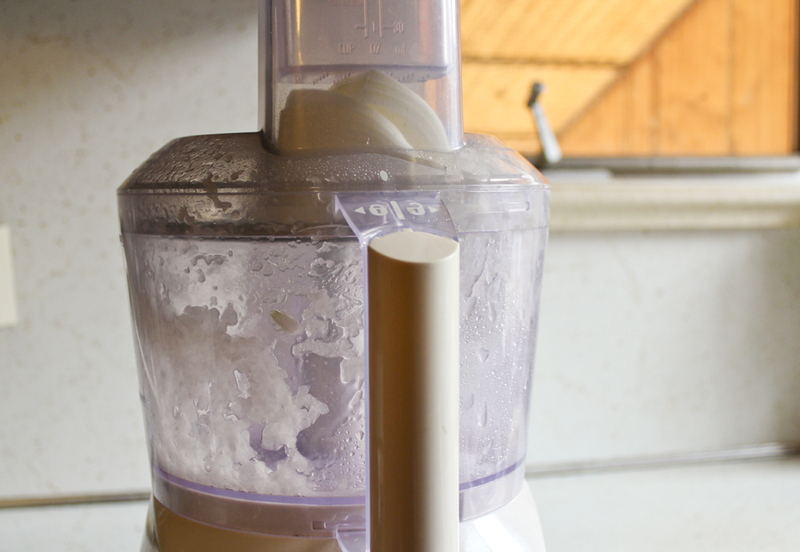 If you're in the mood to babysit onions for 45 minutes on the stove, you should put them in this. So, what is everyone making for Thanksgiving?? I'm going to Minnesota and wanted to do a very lovely regional wild rice stuffing, but Joe voted me down for cornbread. That's okay all-cornmeal cornbread stuffing will be pretty great. Our menu will be some sort of heritage breed turkey (Joe and I insisted - how fancy) with that cornbread stuffing, long-cooked green beans with lemon zest and fresh herbs, mashies, cranberry sauce of some sort, pumpkin pie, and apple crisp with a food-processed pecan, walnut, and oat topping, OH and...homemade ice cream. I think that's going to be the best part. Overall, very simple, and I'm excited about that. I do love to go bonkers with menu planning, but it'll feel good to not feel stressed. It's not my kitchen and we're flying in the night before anyway. There'll probably be a terrible snowstorm and we'll get stuck in an airport somewhere and we won't even have Thanksgiving. It'll be good to not have gotten my hopes up with megamenu. Oh hey, I just realized this isn't a weekend meal! Especially if you have a food processor. I guess it is pretty brunchy... and brunch is for weekends unless you're real fancy and work from home... but it would be a very nice starchy side dish for a dinner. Like, maybe meatloaf. Something peasant-y. 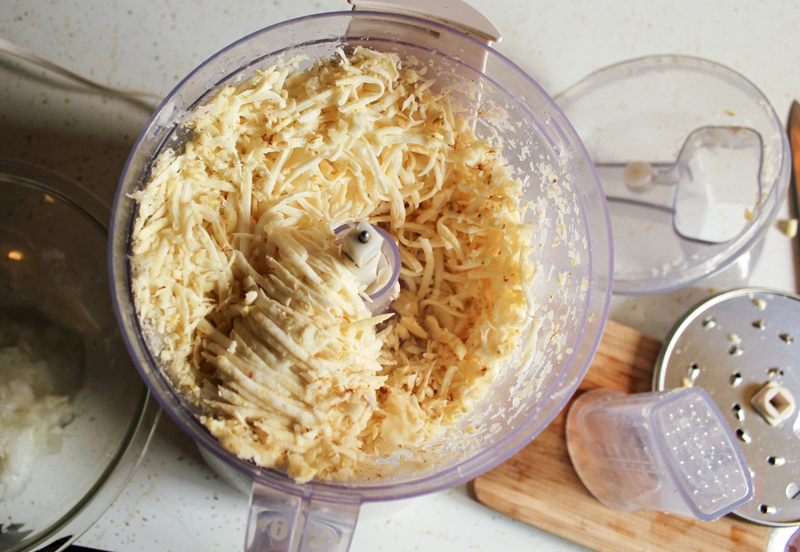 An egg dish - quiche or frittata - sounds wonderful, but a dinner of pie slices seems silly. 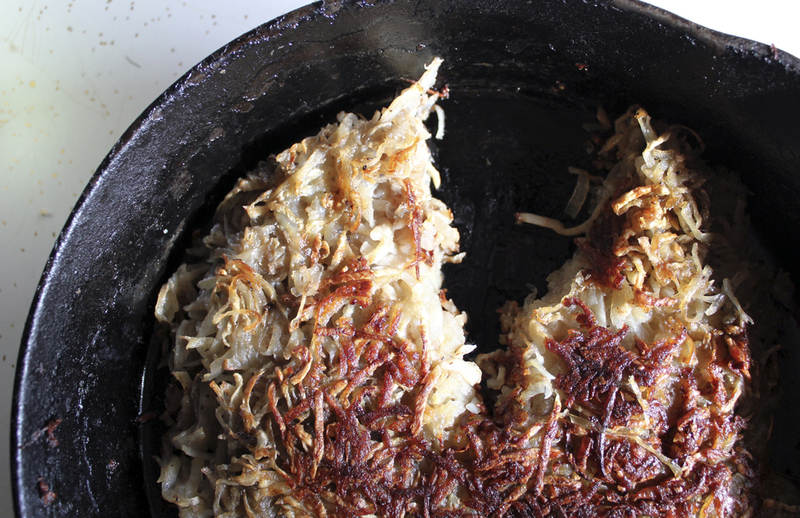 Also, you could do this rösti in two batches if you'd like to make it thinner. Save half of the veggie mixture and make it the next day. 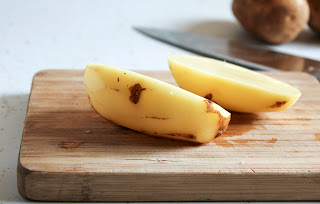 The potatoes will be a bit oxidized, but what, are you too good for oxidized potatoes? note: I'm very sorry if you don't have a food processor with a grating attachment and have to grate this all by hand. I hear it builds character. Or will make you crabby. 1. 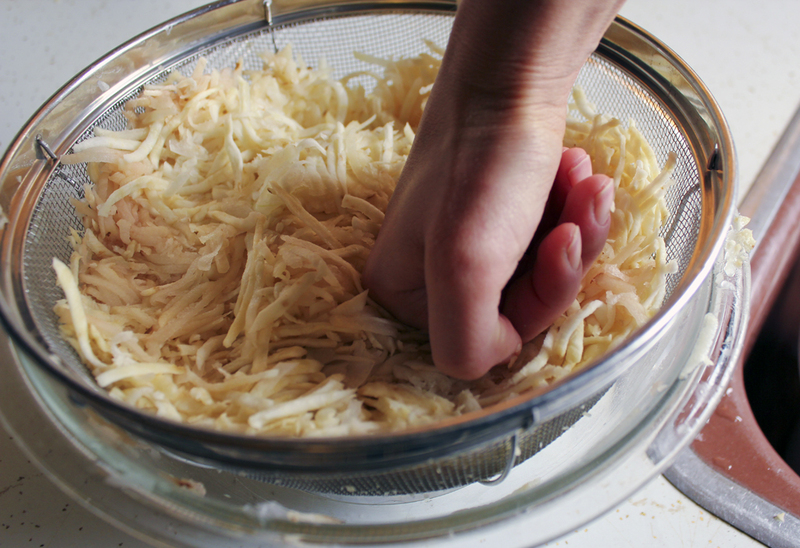 Place all the shredded veggies in a fine mesh strainer and punch them down to squeeze out excess liquid. Put in a bowl and toss with salt and pepper. 2. Preheat oven to 400 degrees. Heat 3 tablespoons oil in a 10 - 12 inch ovenproof skillet over medium low heat. Add the veggie mixture and lightly press down to even it all out. Cook for 10 minutes. 3. 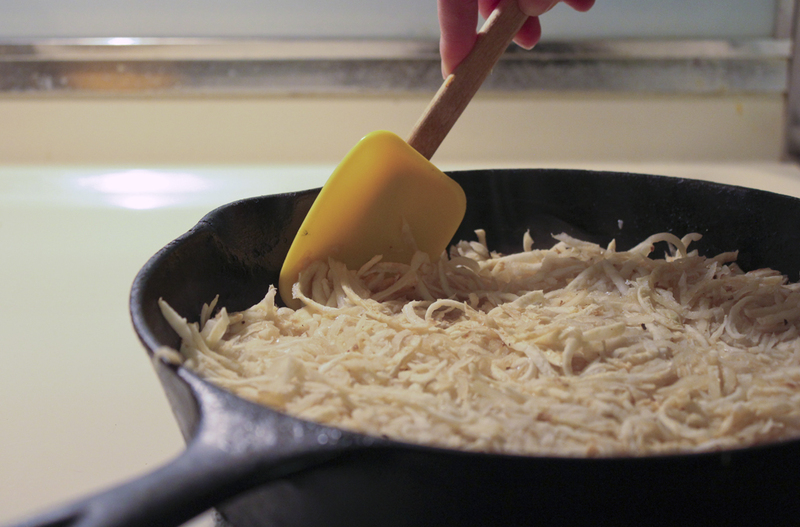 Run a spatula around the edge and add a bit more oil - about 2 tablespoons - under the edge. Cook about 10 - 15 more minutes, lowering heat to low if you can see it getting too dark. 4. Loosen the edge of the the cake and invert onto a plate. Add 3 more tablespoons of oil to the pan and slide the cake back in. Cook for 20 minutes. 5. 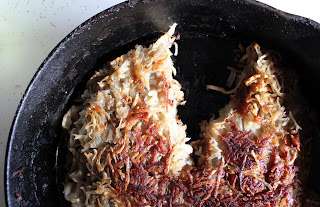 Put the skillet in the oven and cook for 15 - 20 minutes. Cut it up in wedges and you're done! I just had a thought - you could add cooked crumbled sausage in this. Mm! Here is my burnt one. Blast.